Unemployment among deaf people is now at 90%. Thats due to a lack of understanding between society and the deaf communities. 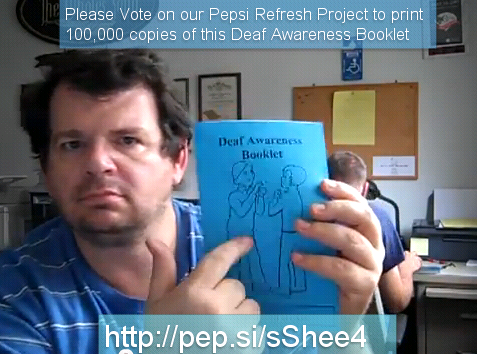 Our booklets goes a very long way toward positive relations between deaf communities and society. If society does not show support for any ideas that would help them co-exist peacefully with deaf people. The ideas will not work to help deaf people find peaceful relations with the society and deaf people will not find employment and remain a heavy drain on our taxpayer resources through their montlly SSI/SSDI payments. You can vote twice Every Day! 2) Vote by sending Text* 109908 to Pepsi (73774) to vote from your mobile. *Standard text messaging rates apply.